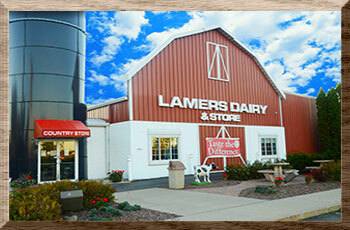 It is not hard to spot our Lamers Dairy Country Store from Hwy 441 in Appleton. Our store looks like a big red barn complete with blue Harvestore Silo. We are located right at Lamers Dairy so you are sure to find the freshest milk and other dairy products available. Exit on CE and find us behind Festival Foods and Lowe’s. Come in through the door in the blue silo. Once inside, you’ll be captivated by everything Lamers Dairy Country Store has to offer. Because premium quality rBGH-free milk from local family farms is what we are most known for, you’ll find our full family of products at the Lamers Dairy Country Store, including our popular milk in returnable glass bottles. We are so passionate about the quality of our milk that we invite you to watch us bottle it through our 30 foot viewing window. 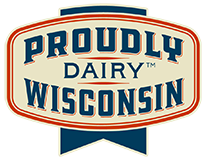 You’re likely to see our president, Mark Lamers, and his brothers, Joe, Tom and Tim working in the dairy themselves to make sure the Lamers Dairy milk you serve your family lives up to its Dairyland’s Best name. Call for best viewing times. To celebrate our 100th Anniversary we commissioned artist Sheri Jo Posselt to paint a nearly 30 foot mural of the 100 year history of Lamers Dairy. You’ll find it above our observation window in our dairy store. You’ll find one of the best selections of Wisconsin cheese around. Being a local business, we make a point of supporting other local companies. 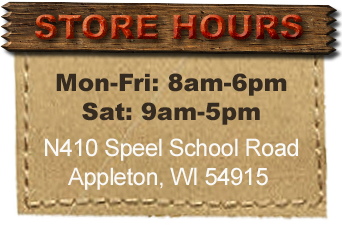 We carry hundreds of Wisconsin products from Soap Dance soap to VandeWalle’s nuts. If you are looking for souvenirs from Wisconsin we have them too. Enjoy delicious soft serve made right here at the dairy from our award-winning rBGH-free milk and cream from small local family farms. Vanilla, chocolate and twist soft serve is available everyday at family friendly prices. Or choose a hand dipped cone from featured flavors of Wisconsin made Cedar Crest ice cream.